Welcome back to my five-part series, Controversy in Fiction. Today, I’ll be writing on a similar issue to last week’s post: Censorship. Unlike Banned Books, however, Censorship allows for certain books but contains many restrictions all the same. Disclaimer: This post may contain controversial opinions that are not necessarily the same as those of readers. However, despite the subject of this post, it contains no profanity. I like to keep my posts appropriate for any age audience. If you haven’t gathered already, I was raised in a conservative, Christian family. So swear words simply weren’t allowed in our house. To this day, my exclamations consist of mild words from drat to goodness and insults from knucklehead to idiot. But that doesn’t mean I didn’t come across profanity in other ways, especially in movies. My first shocking encounter with a book peppered with swear words was Eleanor and Park. I was so taken aback by the amount of cussing within the first five pages, that I had a difficult time enjoying the rest of the book. Paper Towns had a similar feel with its amount of profanity, but was less startling by that point. But young adult books like the ones mentioned above, are not the only books to contain profanity. I don’t read too many adult books, my preferred genres ranging from YA to children’s books. But every now and then, I’ll pick one up, or I’ll decide on a classic. And I’ve found that fiction within the last one-hundred years, includes more and more profanity. It’s not just in some classics or popular books, either. Even some Christian fiction I’ve read contains the occasional swear word. So, what’s the big deal? And how much swearing is too much? Should it be allowed at all in fiction? Censorship is often a means of controlling language for an audience. Like book banning, it may have good intentions, but other times, it could harm fiction. For instance, if somebody were to take out every offensive word in Tom Sawyer or Huckleberry Finn, it might just be easier to ban the book. It might be easier to remove the word “the” from the dictionary than to childproof some books. Don’t get me wrong, I don’t like profanity. I won’t even use it. But I’m not entirely for censorship either. Instead of crossing out major sections of books or limiting accessibility to certain books, discretion should be used when selecting them. Here are just a few of my basic principles for both readers choosing a book and writers writing a book. As a rule for my own writing, I don’t write anything I don’t want my little sister reading. Or if I’m going to read a piece aloud in front of an audience of one or twelve, there will be no profanity. That’s not to say that all new adult or adult books should contain profanity. Goodness, no! But adults typically have more maturity and understand the weight, meaning, and power of words. Maturity I write as I sit at my desk that is guarded by a plush green dragon. Every character is different, and some tend to be more dramatic than others. Some might even be verbally explicit. Often times, a character’s personality is reflected in the way he or she speaks, and the way people speak isn’t always nice. In my novel Breaking a Thief, my protagonist Lorne was raised as a thief, so picking up swear words was natural for her. But because the story was a young adult novel, I substituted actual profanity for mentions of its use. It’s probably the only instance where I strove to tell, not show. In fact, when I sent the novel off to my editor, she suggested that I cut back on some of present mentions of cursing in consideration of my audience. Another character to consider is the narrator. In my latest short story series, I have two narrators with different storytelling styles. Rhona speaks in a sophisticated manner, so whenever other characters swear, she just mentions a curse. Ellard, on the other hand, comes from a more rural background and tends to explain things exactly as he hears and sees them. When reading about characters, it’s often important to consider their background before criticizing their personalities or speech. A light-hearted book about baking or romance will not necessarily contain instances of profanity, but a book about the struggles of cancer or war might. Sometimes darker stories call for darker themes and darker language. That isn’t necessarily to say that we have to like all of the language or the scenes, but such things often reflect the depravity of our cruel, real world. Words aren’t always meant to be liked, but they are meant to tell stories and truths. Literary References: Rainbow Rowell’s Eleanor and Park, John Green’s Paper Towns, and Mark Twain’s The Adventures of Tom Sawyer and Huckleberry Finn. Let’s chat. 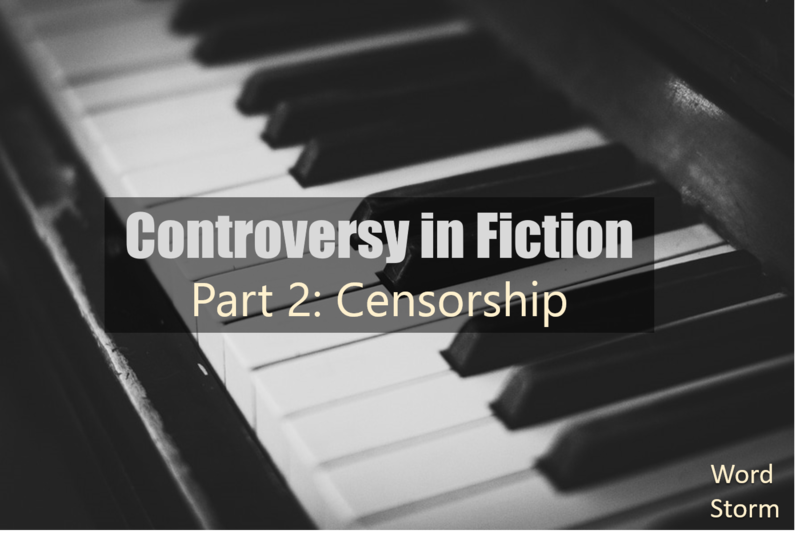 What’s your stance on book censorship? Is there a limit to how much profanity you will tolerate in a book?